2019-03-19 Add option for images with labels inside images. 2019-03-18 Refactoring code, changing name, add reviews, add ratings. 2019-03-17 Add MPN, add price valid until..
2019-01-14 Add Brand logo, add Snippetify Product URL, add Snippetify Product SKU, fix Snippetify Breadcrumb, fix Snippetify Product Price. 2017-04-02 Refactoring, new element, custom format currency, increment version. Delete info from header. 2016-11-29 Fix bug filter AJAX requests. 2016-07-18 Add new element - Avalaibilitity (INStock/OuStock). Fix bug with Currency. 2016-07-18 Add new element - Condition. Replace USD ($) to CZK (Kč). 2014-04-07 07:25:26 Several bug fixes, better pathway results. 2014-03-20 17:09:58 Completely new plugin which provide result better accepted by Google. This plugin inserts Rich Snippets into the VirtueMart product detail. Rich Snippets are standardized structured data which can be easily read by other programs. For example Google can read them and show product information like price right under the search result. Note, that some information will be there only if you use it. For example stock info will be there only if the product has more than zero products in stock. The count of reviews and ratings will be there only if the product was reviewed and rated. In the plugin settings you can set the default brand. This information will be displayed when product manufacturer is not set. Google doesn't display this information anyway so you can ignore it. All other information such as name, availability, description, URL, image, currency, rating, reviews and so on are generated automatically. The plugin will work only if Joomla plugins are allowed in VirtueMart. Go to Components / VirtueMart / Configuration / Shop and there is option "Enable Joomla Plugin" (see the image). You can test if Rich Snippets Plugin works at Google's Structured Data Testing Tool. Q: Will this plugin display the product image? A: Our plugin provides information about the product image, but sadly, Google doesn't display it. If you like to add new features to the plugin, let us know, write a comment, etc. Or simply contact us. Rich Snippets for VirtueMart- plugin can add markup to your product pages so Google can provide detailed product information in rich Search results — including Google Images. Users can see price, availability, and review ratings right on Search results. Rich snippets is a great tool for search engine optimization (SEO) because you tell google robots what they are lookign at; in a nice and structured way. It then tells users what is on the page they have Googled and if it is relevant. Google has Structured Data Testing Tool where you can see how it will be displayed when Google index your web and all information about it. 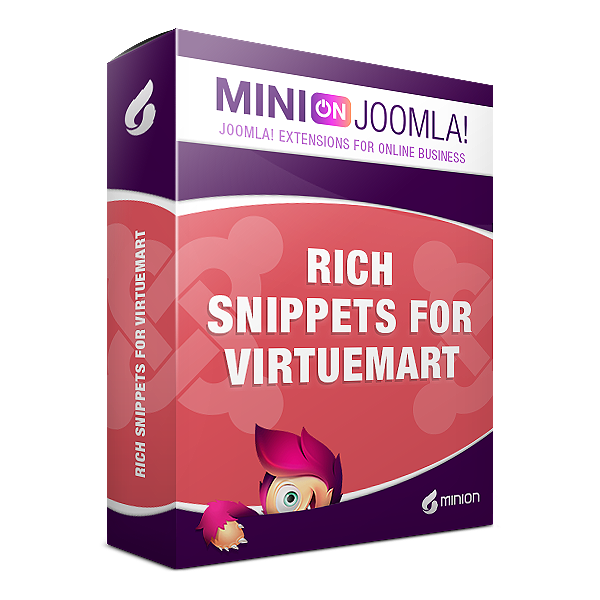 Let's take for example this product - Rich Snippets plugin for VirtueMart. © 2018-2019 Minion Interactive s.r.o. All rights reserved. Minion Interactive s.r.o. and this site www.minijoomla.org is not affiliated with or endorsed by The Joomla! Project™. Any products and services provided through this site are not supported or warrantied by The Joomla! Project or Open Source Matters, Inc. Use of the Joomla!® name, symbol, logo and related trademarks is permitted under a limited license granted by Open Source Matters, Inc.